Google appears to be in the early stages of making its cast technology part of its Chrome browser. 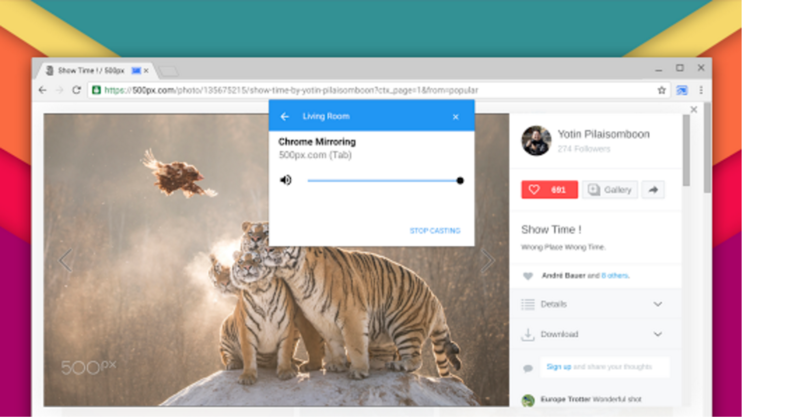 Currently, Chromecast users have to use the Google Cast extension to be able to cast browser tabs, but may change in future versions of Chrome. The chromium team is currently experimenting in Beta Channel with casting tabs without the Google Cast extension installed thanks to the new Media Router¹. By simply enabling the experimental flag “Media Router” at chrome://flags/#media-router, the Google Cast extension will be disabled and you’ll be able to right click on a page and see a new “Cast…” menu (also available in the Chrome menu and in the redesigned Extension Toolbar²). Toggling off the flag will re-enable the Google Cast extension. Chromecast were 35% of all streaming device sales worldwide in Q3, according to Strategy Analytics. The device outsold rivals like Apple TV and Roku. The newest version of the device was unveiled in the fall.